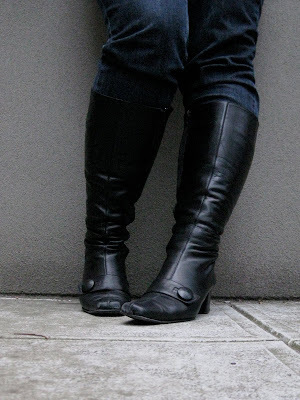 Continuing on the cool-weather theme it occurred to me that now might be a good time to talk about that most covetable item… the wide calf boot. I have big calves. Big, strong, wide, calves. 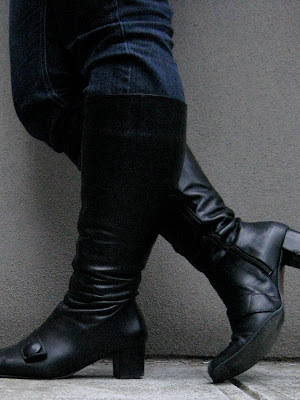 For years I tried and failed to find leather boots that would zip up over my big, strong, wide calves. It was horrible and demoralising and embarrassing and I hated every second of it, but the ephemeral dream of knee-high boots drove me on. Every autumn I could be found in shoe shops around Melbourne trying to judge with the span of my fingers whether these, these boots stood a chance of zipping up before daring to ask the sales assistants for my size. Inevitably they wouldn’t, and each time I would be subjected to the same mortifying pantomime as the staff member would struggle with the zip trying to assure me that the boots would stretch, while I red-faced tried to tell them that no, they wouldn’t. Well, thankfully, those days are no more, and thanks to the magic of teh interwebs I have not one, but six pairs of knee high boots! Duo Boots are a great UK based company that fit boots not just by shoe size, but by calf width too. Such a simple idea, but such a brilliant one! I’ve got two pairs of Duo Boots at the moment (you’ll see the second pair later this week), but I’ve bought and retired another three pairs so I’ve had a fair bit of experience with the brand. All of the boots at Duo are 100% leather, and personally I’ve found the quality very good, though I’ve read a few reviews online from the occasional buyer who hasn’t had as positive experiences as I have. The customer service is excellent, and you should definitely take advantage of it because the sizes and widths can fluctuate between styles somewhat. International shipping isn’t cheap – £20 per pair – but it is extremely fast. I’m on the opposite side of the world and I’ve never had to wait longer than a week from shipping for my purchases. One of the best things about Duo Boots is the range that’s available: They have different heel heights, different toe shapes, different leather styles and colours so you’re not limited to a basic all-purpose style. This entry was posted in Uncategorized by lillipilli. Bookmark the permalink. I think the best thing about DUO is that their sale period occurs just before our weather turns so we can buy cheap boots for our upcoming winter! The alternative is to take 'normal' size boots to a shoe repairer and had them stretched. Not all of them do it and you have to shop around, but I found it worked a treat! I have some of their flat ballerina shoes- as i have awkwardly annoying shaped feet and its so great to find some that actually don't make my heels cry! I'll have a look on their website. I have to admit – it's nice to see I'm not the only one with the ankle bunching issue. I have a pair of off the rack wide calf boots that I bought in Canada and the ankles bunch something fierce. I am travelling at the moment and literally just got back to my room after visiting Duo boots fitting room store in Central London! I saw their website and wasn't game enough to buy without trying but the boots I just tried on were great! The sales assistant was so helpful in measuring my widths and told me they will have plenty more styles in August than they currently do have. The only think I found I wasn't particularly find of was that the length of the shoe was quite long compared to what I normally wear but this would be different for everyone. There is also a Melbourne based company I have a stunning pair of leather boots from called Bennetts Boots. The fit on them is brilliant! So far I cant fault the 'Office Boot' pair I have but some of their styles are a little outdated and the 'tan' colour does look a little strange. But the basic black boots are great and they are Melbourne based. Looking forward to seeing the rest of the boots in your collection! I've always just stuck to ankle length boots to avoid the problem, so it'll be nice to have some other options. What I love about Duo is that they make boots for people with all different shaped calves – I don't know many people who fit properly into normal boots. They are either too big around the calves or – like for me – way too small. By offering different widths as well as lengths they make buying boots so easy. I am currently eyeing off a pair of Genovas. Bad Kitty! Hi Maz, I wasn't able to find a shoe repairer who could stretch them that much, lol!I have really, REALLY big calves. A few suggested inserting an elastic panel, but I was a bit unconvinced. I should really try their regular shoes some time, Aoife. I've got reasonably wide feet, and they always look so comfortable. re: the weight – I wish I knew! I threw my scales out a few years ago (best. decision. ever) so I really just judge things on how clothes are fitting. I *think* I'm losing weight, but it kind of defies sense because I've practically given up going to the gym and I eat out ALL THE TIME. I think I've been getting out and doing things more than I did before last year's epic breakup (my ex was a housebound World Of Warcraft addict). Plus I'm happier. So maybe that's the secret. Oooh, maybe you should wait for August Sheila! The Anonymous poster below says they'll have lots of new goodies then – and probably a sale, too. Hi Short n Redheaded. Yep – I've got two pairs, actually. Stay tuned! I was looking at that site yesterday, Anonymous! Thinking I'd see if I could find some paler boots, since the pair I ordered from Evans are Not So Great. But the tan are a funny colour? Maybe I should go check em out in Hopper's Crossing before committing to the order. Thanks for the headsup on the new styles at Duo too. Hi. 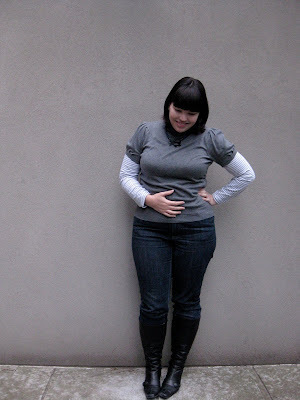 I'm a fan from Fatshionista on LJ and just started following your blog. I've always loved your style. You're one of the few people I've seen who truly looks fab in skinny jeans and tall boots. I've never been able to fit into boots and I eventually found a pair with an elastic panel on the back from a shoe store (I think it was called Nick's? )on King St, Newtown, Sydney. I think the brand was Zak. It's got a square toe and with a little bit of a heel. Makes me feel like a crime fighter, so I'm on the look out for a pair that make me feel a bit more lady-like! Thanks for the suggestions everyone. I love those boots Lilli, they are gorgeous!! Im so excited that a store near me is about to start selling embody jeans!! Cant wait to go and check them out, I have always admired the ones you wear!!! I know that Kumfs have several styles in a really nice looking riding boot that fit very generous "netball" calves. One called "Silver" (that I bought) has two elastine panels up the back that give a great shape and are super comfy. The other one comes in 2 calf widths and has a removable stirrup. The narrower one is called "Brumby" and the wider one is called "Saddle". The staff were great while I tried everything on, no red faces there! Kumfs stores are all over NZ and Oz. how do you find the sizes compare with australian sizes? i'm a 42 (Australian 11) and have enough trouble finding those and was very excited to see Topshop had 42s. Brilliant! Ordered, arrived and they're tiny! Not a 42 that I'm used to at all. So, while Duo does 42s, I'm worried that they won't be the same as here. Did you find they are the same length-wise as your European size shoes here? Scatter: theres an online store called Barefoot Tess. Massive range of size 10 and above in womens fashion footwear. Some of it is really awesome it almost makes me wish I had bigger feet! I think tess is like a 12?? I have found some brilliant "athletic calf" boots recently by a company called Boston Belle & also BB boots & they are both sold in the small town I live in!!!!! We are lucky to have an amazing shop called Ruby Maine that sells shoes, children's wear & homewares & I think they are going to be online in the next week or so. Definitely worth checking out….. By the way I adore your blog & you are looking fabulous! I live in the UK and love Duo for boots. I don't have large calfs, but I do have BIG feet and they make their lovely things in my size. It's a pleasure to shop there! Yours look great btw and I love your blog! Oooh if anyone is strapped for boots in Melbourne, Australia – I just bought a pair of Boston Belle boots and they are so wide I have had to lace them up quite tightly (which looks fabulous as they have laces at the back – v flattering). I am about a 39.5 and I got a 40 and the feet are wide enough to accommodate my orthotics. I am THRILLED!!!!! They are leather, knee high, v low heel and cost $279.95. I live in Richmond and bought them from a shop in Richmond Plaza (if that is any help to anyone who lives locally). I have been wearing them all day and they are super comfortable too. Just wanted to let you all know (well the Australians anyway). Hi, and I got a pair of Boston Belle plus black ones, elastic backs over the calf, and they are the first most wonderful pair of boots I have had since I was living in London in the 60's… I am now nearly 70, and feel so great/happy that at long last I can buy some boots that fit me., I got them from The Carpenters Daughter, one of 4 shops in New Zealand, about NZ$340.00 that have wonderful plus size clothes.. Yes, they are able to be found in New Zealand, and they are soooo comfy.. Really?! That’s fabulous, Kitty – I didn’t know, thanks for the heads-up!